You’ve got to love two fabulous ladies who know how to truly have fun and a good time! 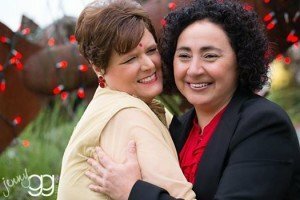 In celebration of their 25 years together, Cindy and Sandra exchanged vows at Salty’s on Alki, in a sweet and personal wedding ceremony, surrounded by their best friends and people. To open their ceremony, and in a “planned surprise move,” Cindy stopped me, saying she had something to offer Sandra. And magically, three “back up singers in festive boas and hats” appeared and Cindy lip synced a special song to Sandra. Talk about fun! Talk about laughter! Talk about pure joy! Creating a surprise within a wedding ceremony is a sensitive thing. It must be well planned and executed and Cindy did an over-the-top job around this. Sandra was totally susprised and elated and the two of them ended up doing a little dance as the song and the surprise played out. I just stood on the side lines with a sloppy grin on my face, so delighted to be in a room bursting with happiness! Cindy and Sandra – I wish you much happiness in your marriage adventure.